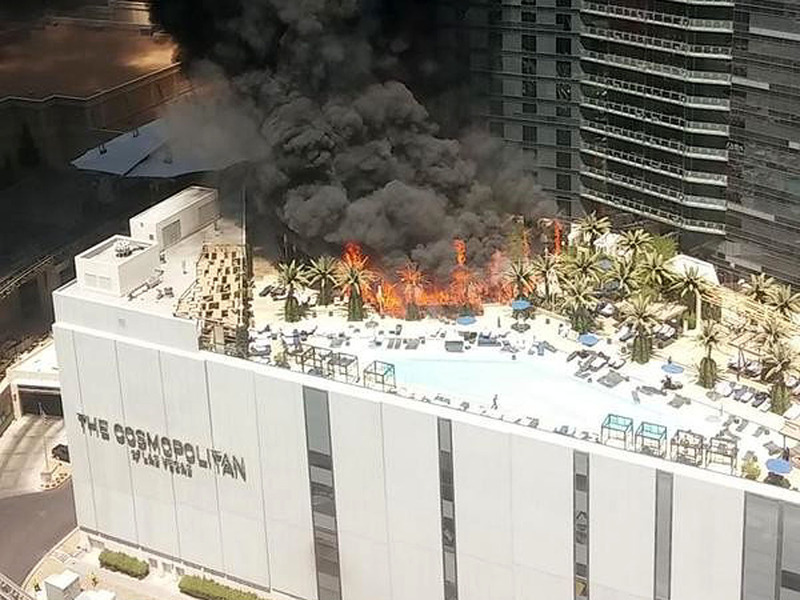 LAS VEGAS -- A two-alarm fire at a hotel swimming pool that sent large plumes of black smoke high above the Las Vegas Strip appears to be under control, CBS affiliate KLAS reported. Clark County fire spokeswoman Sandra Baker said Saturday afternoon that initial reports indicate the blaze at The Cosmopolitan of Las Vegas hotel has been put out. Baker says crews are handling evacuations of the hotel and checking for any other damage. Baker says the fire started at an outside pool area, and pool cabanas and trees were ablaze. The cause of the fire has not been determined. Emergency vehicles were called to the resort shortly after noon. Heavy smoke was visible to people walking along the Strip.